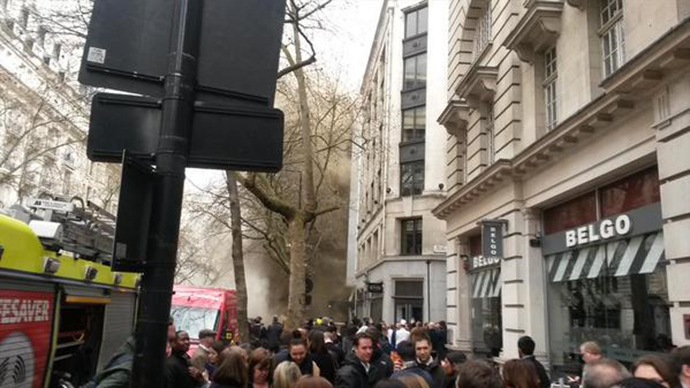 Buildings have been evacuated as a huge fire started under a busy central London street. Around 2,000 people have been evacuated from the Kingsway and smoke can be seen billowing through the street. "I just saw loads of smoke. You could smell the smoke as soon as you got outside. Every building in holborn, Chancery Lane, The Strand was being evacuated. I thought it was a bomb." - Roads - Kingsway is closed between Holborn and Aldwych (Westminster Council Road). The Strand Underpass is also closed and Waterloo bridge is closed northbound. This is leading to serious delays along the Strand back to Trafalgar Square and also around Waterloo. An RT video captures the scenes. A policeman can be seen struggling to breathe as smoke tears through the street. - The fire fighters have not been able to tackle the blaze effectively because they are waiting for utility companies to switch off the resources. Crews are still working to tackle the blaze, reports say. Ironically, a production of 'The Play That Goes Wrong' at the nearby Duchess Theatre has been cancelled this evening, due to the ongoing blaze. Pictures of flames erupting from a manhole cover are also beginning to emerge from the scene. ITV news gained access to the first aerial images of the fire, showing the extent of the affected area. There are reports of now nearly 70 fire fighters on the scene, and one BBC journalist has claimed the fire started with a ruptured pipe. "Our internet went out around 12.30, and an hour later the lights went out. We've been told that it's unlikely we'll be back on the grid before the end of the day. There are fire engines on Kingsway, and smoke billowing out of the Civil Aviation Authority building."